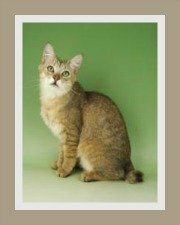 Get hooked on the American Wirehair cat, a cat with a crimped or rexed coat. 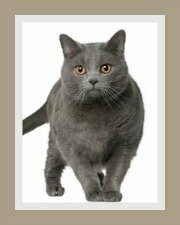 The breed standard for the 'Wire', as it is fondly called, is not dissimilar to that of the American Shorthair - apart from its very special coat that is! 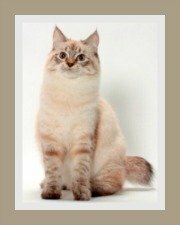 This unique cat breed remains uncommon in the land of its birth and is also one of the rare cat breeds. This was the first rex-coated cat to be found in the USA. This somewhat prickly coat is said to be the result of a spontaneous mutation of a dominant gene. The American Wirehair's coat has short, springy, dense and coarse hair and curly whiskers. The hair is hard to the touch, but flexible. Individual hairs are tightly crimped with either a hook at the end or slightly bent. The coat comes in most colors, shades and patterns, but Lilac, ColorPoint and Chocolate are not accepted colors. 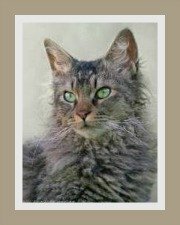 Some of the recognized colors and patterns are the solid colors (black, blue, cream, red and white), Classic and Mackerel Tabby, Parti-colors (tortoiseshell and calico), Smoke and Bi-Colors. Like the American Shorthair, the Wirehair is a medium to large domestic cat. It has a solid build with well developed muscles and medium-sized bones. One of the distinguishing features is its powerful and defined shoulders, chest and hindquarters. To complement the body, the legs are also heavily muscled and of medium length. The tail is in proportion to the body - it tapers from a well rounded rump to a 'roundish' tip. The 'Wire' has a large head which complements the body and prominent cheek bones and a square muzzle and chin. You can expect to find jowls in adult mature male cats. Ears are medium-sized with round tips. Its large eyes are fairly wide-set and round in shape. The eye-color is always appropriate to the coat color. The American Wirehair cat does not like to be confined. So this means that apartment living would not be ideal. What it needs is an enclosed, escape-proof garden, a space to exercise, hunt and explore. The safest option is to create a cat enclosure that leads off a room from the house. An adventure zone filled with non-toxic plants, cat gyms, cat scratchers and toys. How do they adapt to children and other pets? It is generally at ease with children. Cats and kittens need to be handled gently and children need to be taught how to handle cats. This cat tends to dominate other cats. They do get along with 'well-behaved' dogs. Chatting to owners of these crimped-coated cats, we got conflicting views about their personality. Some owners describe their Wirehair cat as a calm, reserved, loyal and an affectionate companion. 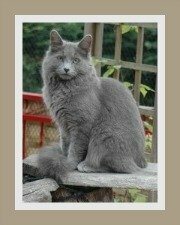 They go on to say that it is a gentle, quiet and a laid-back lap cat, but stress that placid does not mean anti-social! The 'Wire' is a people-orientated cat. 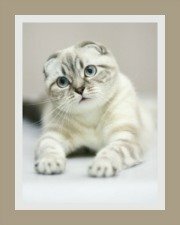 On the flip side, other owners describe their cats as active and agile cats that demonstrate a keen interest in their surroundings. This cat tends to rule the roost - (what cat doesn't)! This intelligent and inquisitive cat does need exercise to burn off excessive energy. It loves to play, but is not overly demanding of your attention. The Wirehair is a medium maintenance cat. A once-a-week light brush will do. It is prone to producing excessive ear wax, so its ears will require frequent cleaning. This domestic cat has an oily skin, so regular sponging or a bath would be appropriate. 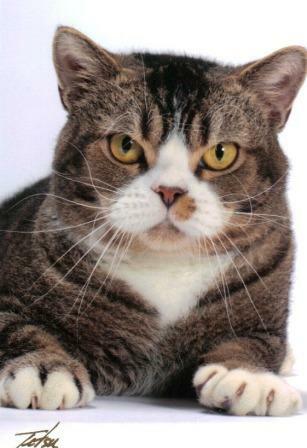 The American Wirehair is generally a healthy breed, with few health problems. Naturally, responsible pet owners will vaccinate against all the common cat diseases. The coat tends to be 'unstable'. It is prone to hair loss and hair breakage which can be triggered by environmental factors like weather and stress. The American Wirehair cat's skin can be sensitive and prone to skin allergies. Cat health insurance is always advisable. We have prepared important guidelines for pet insurance to assist you with making the right choice. This kitty does not need a special diet. They do of course need a well-balanced diet. Diet information can be found on our cat nutrition and cat food pages. Water is an essential part of your cat's diet, be sure to provide clean, fresh water every day. (Cats drink water, not milk. 3.5 - 7.0 kg (8.0 - 15.0 lbs) is the average healthy weight, but male cats are larger than the females. Cat life expectancy depends on a number of things, but on average, your American Wirehair should live between 9 - 15 years.